A - When Henry Selick delivered the ambitious, whimsically prickly The Nightmare Before Christmas in 1995, I doubt that he had any inkling that his little fable--rendered via the exhausting, old-school technique of stop motion animation--would become a cultural touchstone for a generation of nostalgic goths and wannabe goths, who grooved on the film's mashup of Jules Bass Christmas specials and Tim Burton's droopy sensibilities. (Not that I'm speaking from personal experience of anything. *Cough. *) In the years that followed, Selick made a blander stop motion follow-up and a rather notorious flop, but with his new film, Coraline, the director has come blazing back to the front lines of both feature animation and "mature" children's storytelling. Here is a film that dares the viewer to resist its enchantments and terrors, boasting some of the most dazzling design since, well, The Nightmare Before Christmas. However, Coraline decisively surpasses Selick's previous milestone in both a technical and artistic sense, setting a high-water mark for the sort of intricate, captivating animated stories that seem in short supply these days. And the story! The sooty fingerprints of modern myth-spinner Neil Gaiman are all over this wondrous tale, which borrows equally from Victorian nursery literature, kid-savvy afternoon TV fare, and a Hero's Journey that would make Joseph Campbell do a double-take. That's really all I need to say about the story--the sly, gradual manner in which the film unspools is exquisite--but it will quickly become apparent that Coraline is a horror film, not in the slasher-film sense, but in the sense in which all fairy tales are fundamentally horror stories. That is, it features a transition from the familiar to the fantastical, with the fantastical at first appearing sweet but eventually revealing itself as monstrous and twisted. Gaiman's original novella might hew to this template, but Selick not only preserves it in his screenplay, but expands on it through a gorgeous, fun-house aesthetic of breathtaking density. Here is where Coraline represents a world-building feat that leaps far beyond Nightmare's achievements. For while the latter film's look was giddy, gothic fun, it remained a kind of spookshow diorama, one that dovetailed neatly with Tim Burton's long affinity for puppetry's otherworldly, self-conscious fakery. Not so with Coraline, where Selick conjures a marvelously realized universe that feels complete, inhabited, and oddly real. 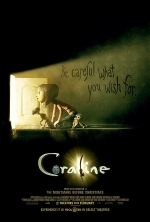 Offering a wondrous rejoinder to the notion that design is a factor disconnected from cinema's artistic voice, Coraline lays the groundwork for its chilling terrors and rousing heroics with jaw-dropping sensory detail. Although the film brims with whimsical caricatures and supernatural hoodoo, its pleasures are remarkably immediate and visceral. Selick is ruthlessly and joyously committed to his story's status as a harrowing adventure, and the incredible texture of Coraline's world evokes boredom, glee, and peril with equal credibility. The triumph of this approach is manifest in the narrative potency of the film's thrilling third act, which plays out like a frightening monomyth epic for the Cartoon Network set. Gaiman's involvement should be telling, but it bears emphasizing that Coraline is on the decidedly intense end of the scale among animated children's features. Frightening imagery and themes abound, and a drizzling of adult humor only adds to the sense that the film is aimed at an older cohort of kids and their parents. Which is perhaps for the best, as Coraline offers a sophisticated and emotionally resonant examination of child-parent relationships that will likely challenge and provoke young viewers. While Coraline's folks fit the mold of the disinterested, unpleasant guardians that are endemic to this class of fable, the girl herself is hardly a shining hero. Whiny and antagonistic, Coraline has no patience for the pursuits of others, preferring that the world focus on coddling and satisfying her. In short, she is seflish, and her journey into the Other House and back serves as a path to awaken a sensitivity to those around her. The Other Mother, as we eventually learn, is not truly a reflection of Coraline's mom, but of the girl herself and her craving for love. That Coraline's real mother meets her halfway on the return journey from nightmare to normalcy is a reflection of Selick's determination to craft a story with a more intricate emotional life than most other fare for young viewers, animated or not. The central theme in Coraline's sweet-and-sour heart is a touching and magnificent one, never hammered but gently revealed: the maturation of the love between parent and child from simplistic dependency to a respect that is both humane and intensely personal. I can't imagine a more worthwhile and fulfilling journey for the young and young in spirit.